Once you get hooked, you're in it! Test your strength and skill against the world's top arm wrestlers at our arm wrestling organization. Join the UNITED ARM WRESTLING LEAGUE today. Members will receive a league membership card, t-shirt, hat, and up to 12 tournaments a year with cash payouts. Our goal is to raise the profile of competitive arm wrestling in the United States and around the world. UNITED ARM WRESTLING is a worldwide organization dedicated to promoting the sport of arm wrestling and bringing enthusiasts together in community and competition. 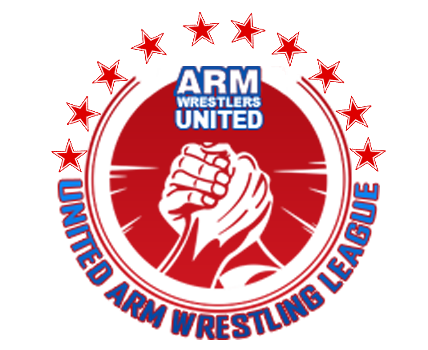 As our name implies, UNITED ARM WRESTLING is all about uniting the arm wrestling community. We are a member-driven organization that values transparency and clear communications. Although arm wrestling is a sport of individual prowess, our true strength lies in our loyalty to one another. Arm Wrestling is a sport that has been around since ancient times, you'll find that the Egyptians have been depicted on an ancient tomb around 4,000 years ago. History has also shown that even the Indians had various forms of arm wrestling. Everyone has arm wrestled someone in their life before, whether it's their mother, sister, brother or neighbor. Male and female competitors range from 15-80 years old in this sport. Many people think that arm wrestling is simply a contest of brute strength. In fact, arm wrestling is a fascinating and highly strategic sport that relies heavily on technique, leverage, and most of all hand control; endurance can play a huge factor as well. Although some competitors rely on lightning fast speed to overpower their opponents, there are more than 12 different techniques to use during matches.